Although I always drink pure milk, for the yogurt, I can also accept. And blueberry has always been my favorite, Jo Jo introduced a magical drink to me –Blueberry yogurt. If you have a boyfriend, it must be a sweet-heart drink.Why not have a try? It is very easy to cook. 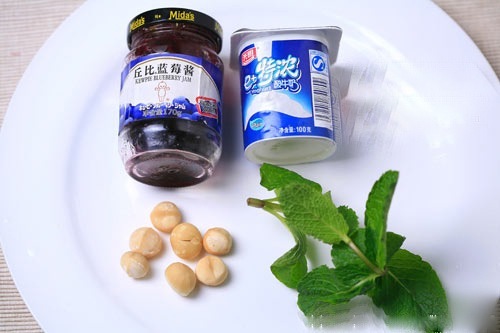 The main ingredients are: blueberry sauce, yogurt, nuts,mint leaves. 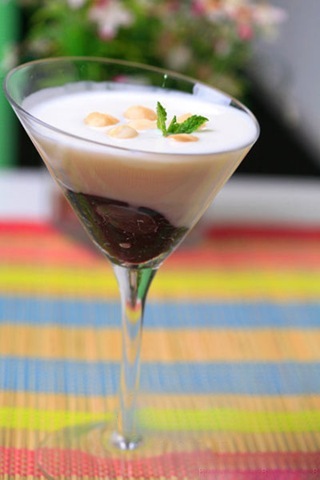 At first, you need prepare a cocktail glass, put blueberry sauce in the bottom of the glass,add yogurt and nuts.For the appearance, plus a piece of mint leaves. Yeah, Blueberry yogurt. is finished.